Ka‘elepulu Pond, located in Windward O‘ahu, is also known as Enchanted Lake and includes about 95 acres of water, wetlands and small, low islands. 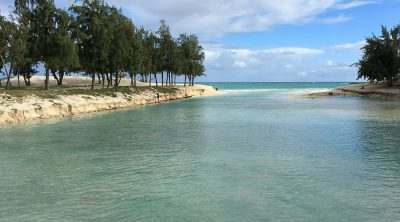 It connects to the ocean at Kailua Beach Park via Ka‘elepulu Canal. Access to the lake is restricted to residents who are members of the Enchanted Lake Residents Association (ELRA). ELRA is a non-profit organization that holds title to and manages a 79.471 acre portion of the lake. The board of the ELRA has taken a pro-active role in the management of the pond, with the ultimate goal of restoring Kaelepulu to support diverse fisheries resources and recreational activities in clean water. The ELRA Board of Directors recently passed a catch and release policy for our Lake. Any animal caught by any means, including fish, shrimp, crab, oysters, etc., must be released expeditiously — unharmed and alive — back into the Lake. We urge all to properly remove hooks and strongly encourage the use of de-barbed hooks. Those who have fun fishing and crabbing can continue to do so! The only change is the fish, shrimp, crab, etc., must be released back into the Lake. This will help keep our lake stock from being depleted and prevent anyone from eating potentially contaminated seafood. It also stops those who would take our fish for commercial purposes. Our goal is to have a healthy, clean lake for our wildlife and our members to enjoy! Board meetings are usually held on the second Tuesday of the month, 7pm, at the A & B community meeting room in Kailua. Residents are welcome to attend. Contact us for date confirmation and meeting location if you are interested in coming. You can read the board meeting minutes or the ELRA e-newsletter. If you would like to be on our mailing list, please sign up. You can check if the State Department of Health has posted any warnings about water quality in the Kailua waters by going here: health.hawaii.gov/cwb/ and then click on "Current Water Quality Advisories." The ELRA board is working to obtain permits and conduct dredging of portions of the lake to improve water circulation, restore aquatic habitat, and re-establish the navigable waterway capacity for public health, safety, and enjoyment. The project would involve dredging up to 23,900 cubic yards of silt, clay, gravel, and aquatic vegetation from various locations within Ka‘elepulu Pond.